One of Surrey's best and most attractive courses, Worplesdon is one of three superb golf courses, well hidden, but at the same lying close to each other in an area between Guildford and Woking. 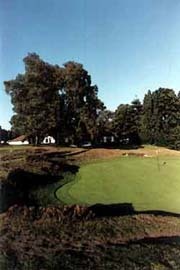 Together with its two neighbours, Woking and West Hill, Worplesdon is rich in heather and fir trees and has all the properties of a first-class inland course. Created by architect, Mr. F J Abercromby, the original design has remained largely untouched since 1907 when he visualised the reality of a top class golf course from what was then just a wilderness of trees and heather. Worplesdon has a wealth of fine holes including some very testing par 3's. One of these, the 10th, is the signature hole with a large lake to carry from the tee and a testing three-tier green. The 13th at 175 yards has been featured in the UK's top 100 holes, with a green that is heavily bunkered on all sides. Work is carried out at all times to maintain the good condition for which Worplesdon is well known. More major works have been carried out recently to refresh the bunkering on the course and to install fairway watering.